Be glad you can't see what's under your feet. "There's no way to even count how many rats are in Portland's sewers," says Multnomah County Vector Control Specialist Chris Roberts. Out of the county's seven vector control experts helping put a limit on pests, Roberts is the only one on rat patrol. "Ninety-five percent of the rat complaints have nothing to do with the sewer," says Roberts. "We'll put out bait in the areas where we get a complaint, but there are very few of those." That's not where the obvious rat problem is, according to Roberts and entomologist Eric Boem with Pioneer Pest Management. It's in your neighborhood. Your yard, your basement, even your roof. Yes, your roof, as in "roof rats." The metro area has two kinds of rats: The Norway, generally gray colored, scurrying around your bushes and basement and sometimes even up the pipes into your toilet; and the roof rat, darker in color and, exterminators say, even harder to get rid of. Since 2013, Pioneer Pest Control has had a 480 percent increase in rat calls from customers. "We had 133 calls that year, and so far this year, we're at more than 650," says Boem. One mother rat can have up to 12 babies in a litter, and can do that every month. Those babies can start having babies when they're two months old. So after a year, a busy pair of rat parents can have 15,000 descendants. And they're all looking for something to eat. "Rats are smart, and they're also neo-phobic" says Boem. That means they're afraid of new things. What that means for you is that they shy away from traps and poison if it's unfamiliar. "We've re-designed our bait so that a rat will try a little, not get sick, then come back and gorge the next day," says Boem. But all too often, rats go for the easier pickings. "Hanging bird feeders is number one by far. Backyard chicken coops is number two, number three is backyard compost, number four is pet food left outside," says Roberts. For the most part, Boem agrees with the vector control expert's list, although he might change the order. "Number one is chicken coops. If you have chicken coops, then your neighbor is going to have to call me about the rats at their place." Garbage is one thing the two experts seem to disagree on. "When Portland started the every-other-week garbage pickup, that's when the number of rat calls began to spike for us," says Boem. Roberts says they get calls about rats in the garbage, but mainly big dumpsters used by restaurants. "Garbage is low on the list as far as complaints go, in residential neighborhoods, but if it's being disposed of on a regular basis it shouldn’t be an issue." And the chickens and the birds aren't the problem, but the seed they feed on is. The rats love it. It falls out of hanging feeders, or it's thrown down by chicken owners, and it's always there on the ground waiting for them. 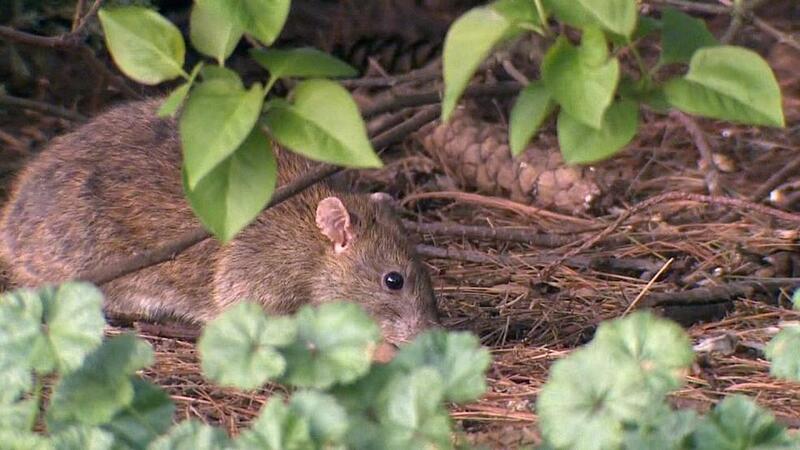 "That’s what causes a rat problem," says Roberts, "is a human putting out a food source. Getting the humans to change their behavior and remove the food source is the key to controlling rats." "How do you pull all the food away from them? So it’s not so much having to pull all their food away, it’s pulling away the food they’re already comfortable with," says Boem. It's even more of a challenge when it comes to roof rats. "It’s really difficult to get them into your trap sometimes," says Roberts, "because they can live independent of humans, they can live off natural food sources and those can be tough to remove." You may have seen the roof rats running along power lines, along fences, jumping from tree to tree. Exterminators say they'll get into your house through holes in your attic, and work their way down, while Norway rats take the low road, getting into your house through holes in your foundation. You can plug the holes to keep them out, but the experts say if you don't eliminate their food source, they'll keep coming back around. Eric Boem thinks, to rid ourselves of rats, maybe we should climb back into the sewer. "If we could figure out how to keep that baited, and keep that treated safely, that is where we would start to gain great ground on the rodent population. If you continue to let it happen, how do you avoid England, the Bubonic Plague, all over again?" If you think your rat problem is happening due to a neighbor's practices, Multnomah County has a neighborhood mediator on staff. Click here to access the website.